While the rest of us are enjoying fireworks, BBQs, and spending time with friends and family, Curiosity will remain hard at work over this Fourth of July holiday. On Monday, the science team planned Monday and Tuesday activities on Mars, while today (Tuesday) they planned Wednesday and Thursday activities. This will allow the rover team to take a well-deserved holiday break on Wednesday! Because of this interesting planning timeline, however, the science team had to make today's plan before Curiosity executed the plan that was created yesterday. This is no problem though, as we're in the same location, so we have plenty of activities to do and know which targets to focus on. In yesterday's plan, Curiosity used her arm to acquire Alpha Particle X-Ray Spectrometer (APXS) measurements on three targets - one brushed with the Dust Removal Tool (DRT) and two unbrushed targets. Today's plan will use the arm to acquire high-resolution images of these three targets (named "Dumbarton Rock," "Duntarvie Castle," and "Duntelchaig") using the Mars Hand Lens Imager (MAHLI). There was quite a bit of discussion about how much time the MAHLI and other images acquired by Curiosity would take in the middle of this dust storm, now that the sky is much darker than usual and the illumination conditions are very different from the typically clearer skies that Curiosity has been used to for the past several years. In the end, it was determined that imaging would not be significantly influenced by the darker and dustier skies. A ChemCam LIBS analysis was also planned on the "Callanish" target, which is a layered block just off the right front wheel of the rover. This observation will help in our continued documentation of the chemical variations observed as we climb back up the Vera Rubin Ridge. 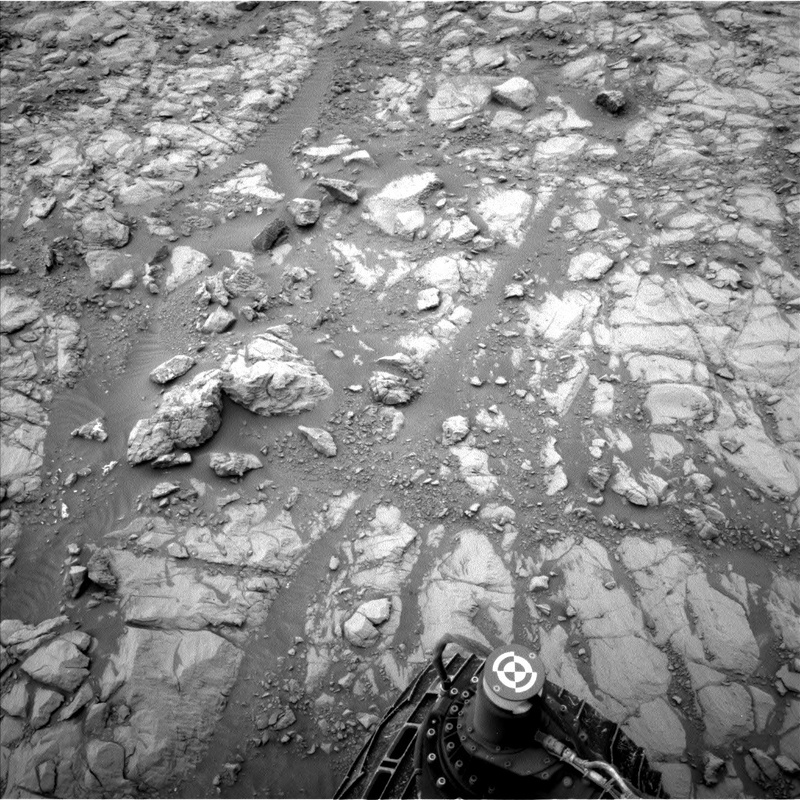 Following these operations, Curiosity will tuck her arm back into its stored position and continue her drive up the ridge. During her drive, Curiosity will acquire frequent images of the ground using the Mars Descent Imager (MARDI). This imaging sequence is referred to as a "sidewalk video," as the final stitched mosaic looks like sidewalk blocks moving across the martian landscape. These sequences help us to see how the terrain under the rover changes as we progress across the surface. After her drive, Curiosity will undertake a standard post-drive imaging campaign to characterize the surrounding landscape, which can be used by the rover team to plan subsequent scientific and navigational activities. On the second day of the plan, Curiosity will obtain automated chemistry measurements using the ChemCam LIBS instrument. These data will be sent down to the rover team before the next planning session.